Here are a couple of closer views of the fresh green moss that I posted yesterday. 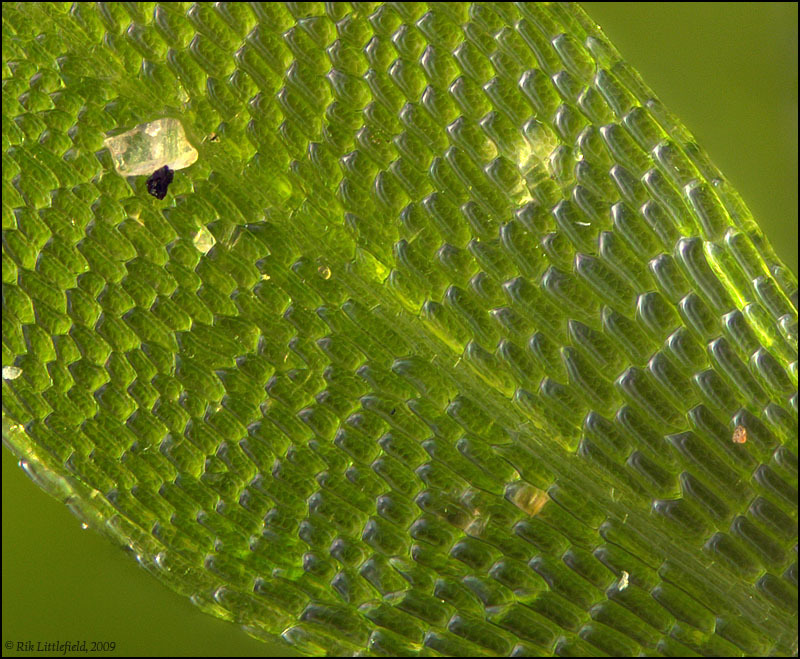 As lauriek wrote, "this makes me want to get one 'leaf' ... in front of a microscope objective!" Me too -- so I did! First frame is 1.9 mm across the field, second is about 0.9 mm (a crop of the first). The attached crystals are lumps of dust. I made one attempt to get them off, but discovered that they're quite thoroughly attached! Technical: Canon 300D, Nikon CF N Plan Achro 10X NA 0.30 objective at nominal 150 mm extension, 77 frames stacked at 0.00033". Electronic flash through Kleenex tissue diffuser, oblique backlighting with just a bit of direct front light for highlights. Oh that's nice! I really hadn't imagined Moss could be so pretty! Is Moss an actual plant (as in plantae) or is it categorised in some other way? Lichens aren't plants are they? The leaves are very pretty up close Rik! 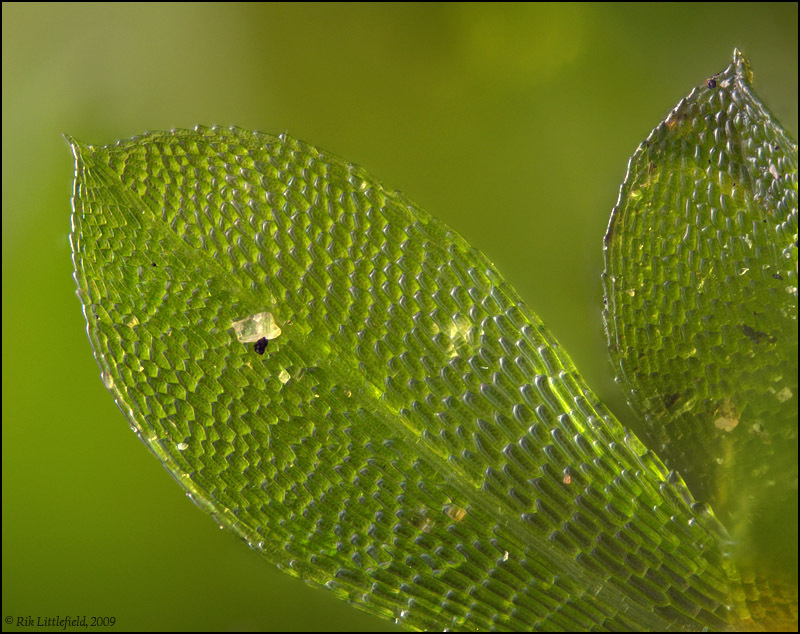 Yes, mosses are plants, division Bryophyta in kingdom Plantae. Unlike most plants, they have no veins. No, lichens are not plants. Quoting Wikipedia: "They are composite organisms consisting of a symbiotic association of a fungus (the mycobiont) with a photosynthetic partner (the photobiont or phycobiont), usually either a green alga or cyanobacterium." Many thanks! The stuff always surprises me too. Just imagine being the size of a springtail, and going for a walk in a "forest" of this stuff! Thanks Rik, I suspected that was the case, I was pretty sure Lichen wasn't a plant but in my mind I group moss and lichen together which I thought may be wrong, thanks for the clarification! I /love/ the idea of being springtail sized and going for a walk in this stuff! Ahh after a quick google it seems "Lichens are classified by their fungal components." although "The taxonomy of lichens is a shifting and uncertain system." (From http://www.mbari.org/staff/conn/botany/lichens/taxonomy.htm). "Lichens are classified by their fungal components." Taxonomy is the science of naming organisms. In a biological classification system organisms should be named according to their evolutionary history. Very closely related organisms belong to the same species. Several species belong to the same genus, genera make up a family and families belong to orders, classes and finally kingdoms. How can we classify a lichen? There are at least two very different organisms involved in the lichen symbiosis. Obviously fungi, green algae and cyanobacteria do not share the same evolution. Within the symbiosis all partners may have been suscepted to the same evolutionary forces. Partners within a symbiosis may thus have co-evolved as soon as they entered the symbiotic relationship. Nevertheless the different partners do not share most of their evolution. Which evolutionary history should therefore be referred to by the scientific name of the lichen? Taxonomy of lichens simply interprets lichens as a special form of a fungus which has found a way to exploit algal cells or cyanobacteria. Lichen names therefore apply to the fungus alone as well as to the lichen symbiosis, the way this fungus is associated with algae or cyanobacteria. This concept may be difficult to understand but there are several reasons why the taxonomy of lichens is largely the taxonomy of lichenized fungi. The mycobiont is an obligate symbiont. Under natural conditions lichen fungi have not been found free-living. The photobiont cells are facultative symbionts which can frequently be found independent of the lichen symbiosis. A huge diversity of lichen fungi can be distinguished whereas only very few species of photobionts have been found in a lichen symbiosis. Here I was thinking to myself that I was the only one who prowled around in mosses. Well... Beautiful and most detailed image there Rik, a lot better than what I would get through my dissecting microscope! Lichens are pretty neat too.